Back again! The Teacher Registration Board of South Australia recently sent me out an email informing me about the new portal they have setup. Documenting and tracking professional development from my short time as a teacher (2008 onwards) has largely been an unregulated practice. You would declare at the end of a year that PD was completed, a piece of paper went somewhere and the day continued. 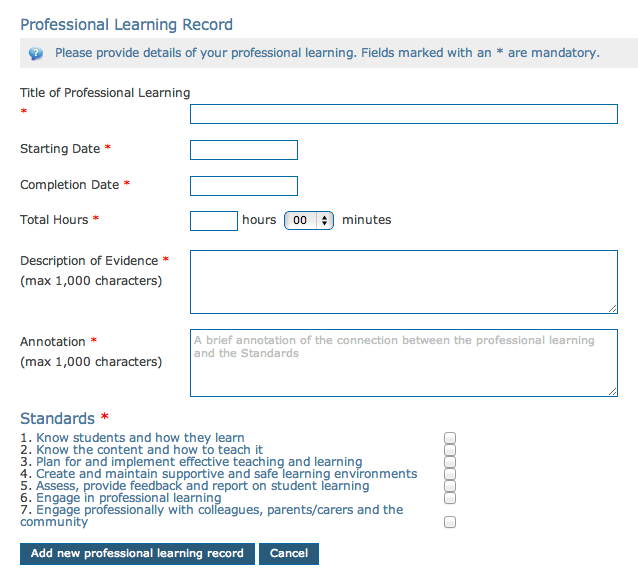 From 2013 teachers will have to now evidence professional development and how it links to the AITSL Standards via an online portal. I think this is a fantastic step in the right direction of increasing professionalism within the teaching community and modernises a process which was previously quite archaic (to the point non-existent). My new registration period started at the beginning of this year, which means I have until the end of 2016 to make sure 60 hours of PD has been met. Personally this will not be an issue but I am excited at the prospect of having a formal process of monitoring and tracking the PD completed. Discussion about the AITSL Standards is probably better completed in another blog post so I'll leave that out for now. Well done TRB of SA, look forward to reflecting in 3 years time on the PD completed! The following are a few screenshots from the portal page showing the small summary box when you login and the application form when entering a new record.